Aston Martin’s new Vantage GTE has been spied testing at Sebring, ahead of its official unveil later this month. Despite its presence at Sebring, it’s understood the car is still scheduled to make its competition debut in the WEC season-opener at Spa-Francorchamps in May. A team source indicated to Sportscar365 last week that an AMR-run program for the Rolex 24 at Daytona and Sebring is now unlikely, with all focus being put into the rollout of the new car. Spy photos and video, courtesy of “fansofthe12hours”, however show the new-generation Aston Martin on Michelin tires instead of AMR’s current WEC tire partner Dunlop. The GTE car is expected to be formally presented on Nov. 21, alongside its road-going counterpart. Sportscar365 also understands that Twelve Hours of Sebring winner Alex Lynn is among the drivers taking part in the test this week at Sebring. Lynn, who won this year’s race in a Wayne Taylor Racing Cadillac DPi-V.R, is believed to be in contention for a factory seat with the GTE-Pro squad next season. 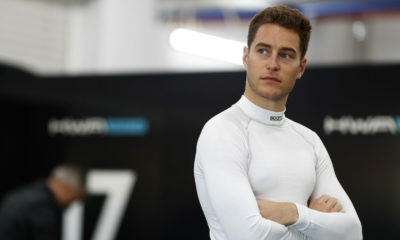 The 24-year-old Englishman recently signed with DS Virgin Racing for a full-time drive in the FIA Formula E Championship, although there are no clashes between the WEC and Formula E next year. Lynn is no stranger to AMR, having taken part in the Bahrain Rookie Test in 2016, although ultimately not having been chosen for a race seat this year. The team has yet to indicate its driver lineup for the 2018/19 season.